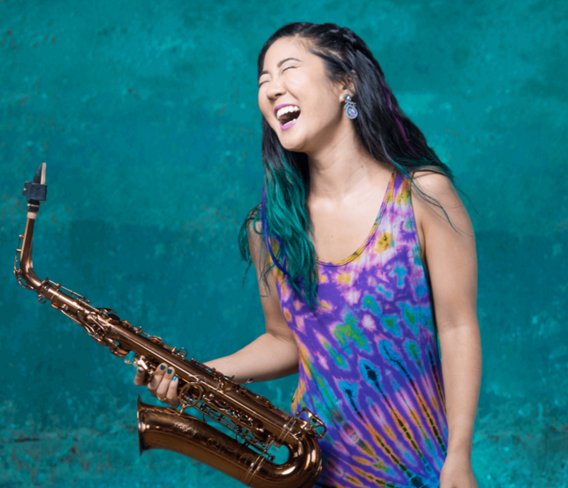 Saxophonist, vocalist, and composer, Grace Kelly, has been building a steadily-growing audience and core fan-base since her first release at just 12-years-old. Now, she has literally opened the doors for her fans, and deepened the connection, by welcoming a small audience to the Systems 2 studio in Brooklyn, New York, for an intimate performance and recording session, all of which was filmed, and is set to be broadcast on Sunday, March 18, via Facebook Live. The date marks exactly 13-years since her inaugural concert as a bandleader. This event is the first in a series of releases expected this year from Kelly; an EP this Spring and a studio album later this year. Beginning at 3:00pm EDT, Kelly and her band (pianist Julian Pollack, bassist Julia Adamy, and drummer Ross Pederson) are joined by dancers and special guests, such as Leo P of Too Many Zooz, and Elliott Skinner of Thirdstory. Members of her in-studio audience are driven to get on their feet and dance with her through tracks, including Fish & Chips, Party Chant, Feels Like Home, Unchain My Heart, and Miss You. An additional set, available on the same date exclusively to her Pledge Music supporters, and to the public in May, will be released as an EP. This outing includes tracks such as Trying to Figure It Out and By the Grave, both fan-favorites from her previous release, unreleased original Count on Me, and Kelly’s take on Billie Jean, among others. Kelly is no stranger to finding innovative ways of getting her music out to larger audiences. Via Facebook, Instagram, and her YouTube channel, she has released more than 50 PopUp videos that feature her playing in non-standard live settings – including locations as unexpected as a gondola in Venice, in the water in Labadee, Haiti, and in New York’s Times Square, the latter in a spirited duet with Leo P.